Primary storage device : It is main storage unit to hold information ready for processor to use while processing. It is small and quick. Exp:- RAM and Catch Memory. Secondary storage device : It is a device that hold information until it is deleted of overwritten. It also called “additional or auxiliary memory”. It is used to store large volume of data on permanent basis. Exp:- Hard disk drive, floppy disk drive etc. Why Secondary storage devices are used? Limited capacity – Small in capacity makes searching easy in return it work faster but it is costly. Modern computers require more and more space. Secondary storage provides large storage space. Volatile in nature – Primary memory gets erased when power turned off. Secondary memory retains data after power turned off also. Costly – Primary memory are semiconductor memory so it is very costly. Secondary memory are mostly magnetic disc memory. 1. Sequential or Serial access : In this type of device informations can only be retrieved in the same sequence in which it is stored. So access time depends upon data location. Applications : Preparation of monthly pay slips, or monthly electricity bills etc. 2. Direct or Random access : In this type of device informations can be retrieved randomly from any where within the storage locations. It is need not to go sequentially. Hence for retrieval of information required approximately equal time for each location. Applications : Computerized ticket booking system. Example : Magnetic and Optical disks. Most popular storage medium for large data, which are sequentially accessed and processed. Medium is a plastic ribbon. Usually ½ inch or ¼ inch wide. 50 to 2400 feet long. Coated with a magnetisable recording material, such as iron oxide or chromium dioxide. Data recorded in the form of tiny invisible magnetized and non-magnetized spots on the coated surface of the tape. The tape ribbon is itself stored in reels or a small cartridge or cassette. Like audio or videotape, the magnetic tape used in computer systems can also be erased and reused indefinitely. Old data on a tape are automatically erased, as new data are recorded in the same area. Their storage capacity is virtually unlimited. With the low cost of tape reels and cartridges, and high data recording densities, the cost per bit of storage is very low for magnetic tapes. Since the tape reels and cartridges are compact and light in weight, they are easy to handle and store. Due to their compact size and light weight,they are also easily portable from one place to another. Due to their sequential access nature, they are not suitable for storage of those data, which frequently require to be accessed randomly. They must be stored in a dust-free environment, because specks of dust can cause tape-reading errors. They must also be stored in an environment with properly controlled temperature and humidity levels. They must be properly labled, so that some useful data stored on a tape is not erased by mistake. For applications, which are based on sequential data processing. Backing up of data stored on an on-line storage device,so that , if by accident, the data is corrupted or lost, it can be retrieved from the backup tape. Archiving of data which are not used frequently. Transferring of data and programs from one computer to another, which are not linked together. Distribution of software by vendors. Most popular storage medium for direct-access secondary storage. Due to their random access capability, magnetic disks are the most popular on-line secondary storage device. A thin, circular plate/platter made of metal or plastic, which is usually coated on both sides with a magnetizable recording material, such as iron oxide. Data are record on the disk in the form of tiny invisible magnetized and non-magnetized spots on the coated surfaces of the disk. EBCDIC is used for recording data. The disk itself stored in a specially designed protective envelope or cartridge, or several of them may be stacked together in a sealed, contamination-free container. Like magnetic tapes, magnetic disks can also be erased and reused indefinitely. Old data on a disk are automatically erased as new data are recoded in the same area. However, the information stored can be read many times, without affecting the stored data. 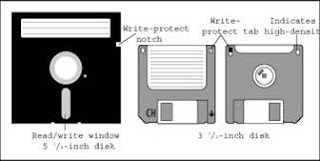 Floppy disks : In floppy disks, disk is individually packaged in protective envelopes or plastic cases. A floppy disk is a round, flat piece of flexible plastic, coated with magnetic oxide. It is encased in a square plastic or vinyl jacket cover . The jacket gives handling protection to the disk surface. Moreover, it has a special liner, which provides a wiping action to remove dust particles, which are harmful for disk surface and the read/write head. Floppy disk are so called because they are made of flexible plastic plates, which can bend, not hard plates. They are also known as floppies or diskettes. They were introduces by IBM in 1972,and are know been produced in various sizes and capacities by many manufactures. Its diameter 3 ½ -inch. The disk encased in a square, hard-plastic jacket cover. The jacket cover has a cutout (aperture) for the read/write head to make contact with the disk surface. The aperture is covered with a sliding metal piece. When the diskette is inserted into the drive, the cover slides back to expose the disk surface to the read/write head. Now day floppy disks are out of trend. Hard disk are the on-line storage device for most computer system today. Unlike floppy disk, which are made of flexible plastic or Mylar, hard disk are made of rigid metal (aluminum). The hard disk platters come in many sizes, ranging from 1 to 14-inch diameter. 1. Zip/Bernoulli Disks: It is a single hard disk platter is encased in plastic cartidge. 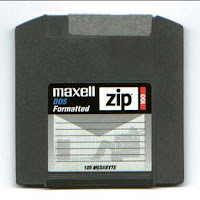 A commonly used zip disk is of 3 ½ inch size, having a storage capacity of about 100-250 MB, depending on the formatting style of computer system. Its disk drive is called a zip drive. A zip drive may be of portable or fixed type. The zip disk can be easily inserted into or removed from zip drive, just as we insert and remove floppy disks in a floppy disk drive or avideo cassette in a VCR. 2. Disk Pack : A disk pack consist of multiple (two or more) hard disk platters mounted on a single central shaft. Hence, all the disks of a disk pack revolve together at the same speed. 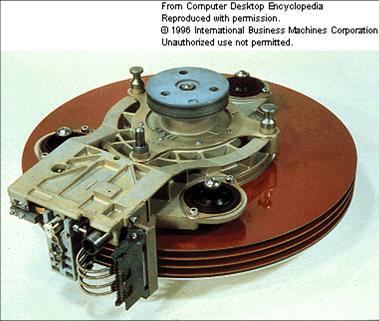 As mentioned before, the disk drive of a disk pack has a separate read/write head for each disk surface ,excluding the upper surface of the topmost disks, and the lower surface of the bottommost disk. These two surfaces are not used for data recording in a disk pack. 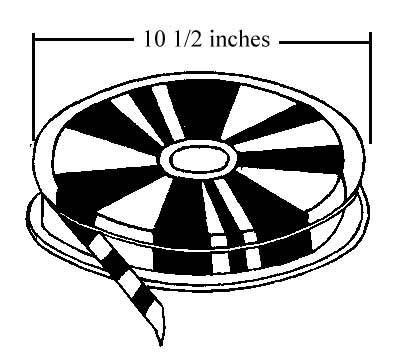 When not in use, disk packs are stored in plastic cases (as shown in figure). They are of removable/interchangeable type in the sense that they have to be mounted on the disk drive, before they can be used, and can be removed and kept off-line, when not in use. That is, different disk packs can be mounted on the same disk-pack drive at different instances of time. This gives virtually unlimited storage capacity to disk packs. 3. Winchester Disk : A Winchester disk also consists of multiple(two or more) hard disk platters mounted on a single central shaft. However, the main difference between a Winchester disk and a disk pack is that Winchester disks are of fixed type. That is, the hard disk platters and the disk drive are sealed together in a contamination-ree container, and cannot be separated from each other. Hence, as opposed to disk packs, which have virtually unlimited capacity, Winchester disks have limited capacity. However, for the same number of disk platters of the same size, Winchester disks can manage to have larger storage capacity than disk packs. Winchester disks were so named after the 30-30 Winchester rifle, because the early Winchester disk systems had two 30-MB disks sealed together with the disk drive. The storage capacity of today’s Winchester disks is usually of the order of a few tens of megabytes to a few gigabytes. Magnetic disks support direct access of data. Due to its random access property, magnetic disks are often used simultaneously by multiple users as a shared device. Magnetic disks are suitable for both on-line and off-line storage of data. The storage capacity of magnetic disks is virtually unlimited. Due to their low cost and high data recording density, the cost per bit of storage is low for magnetic disks. They can be erased and reused many times. They are easy to handle and store. Due to their compact size and light weight, they are easily portable from one place to another. Data transfer rate for a magnetic disk system is normally higher than a tape system. Magnetic disk are less vulnerable to data corruption than magnetic tapes. 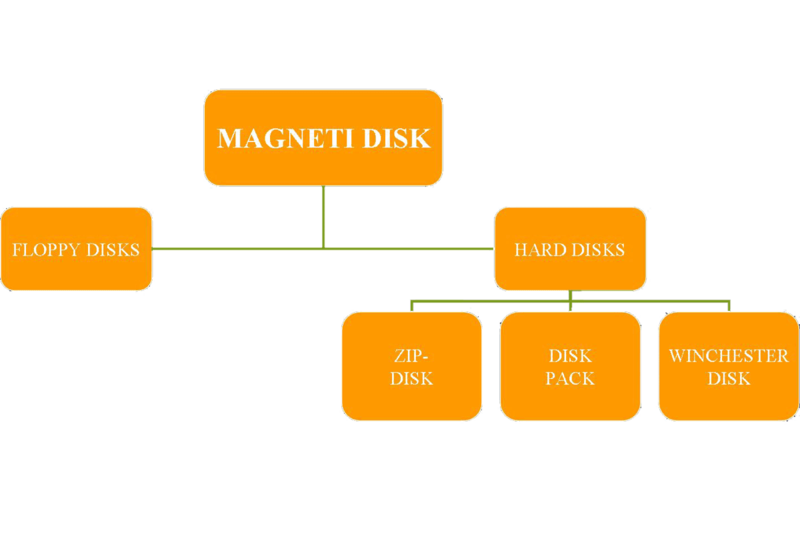 For sequential data processing applications, the use of magnetic disk may be less efficient than magnetic tapes. It is more difficult to maintain the security of information stored on magnetic disk, which are used as shared, on-line secondary storage devices. Suitable backup procedures are suggested for data stored on Winchester disks due to disk crash or drive failure. Some type of magnetic disks, such as disk pack and winchester disks, are not easily portable like magnetic tapes. On a cost-per-bit basis, the cost of magnetic disks is low, but the cost of magnetic tapes is even lower. They must be stored in a dust-free environment. Floppy disk, zip disk and disk packs should be labeled properly to prevent erasure of useful data by mistake. For applications that are based on random data processing. As a shared, on-line secondary storage device, Winchester disks and disk packs are often used for this purpose. As a backup device for off-line storage of data, so that if by accident, the data on an on-line storage device is corrupted, it can be retrieved from the backup storage. As compared to magnetic tape and magnetic disk, optical disk is a relatively new secondary storage medium. During the last few years, it has proved to be a promising random access medium for high capacity secondary storage, because it can store extremely large amounts of data in a limited space. An optical-disk storage system consist of a rotating disk, which is coated with a thin metal or some other material that is highly reflective. Laser beam technology is used for recording/reading of data on the disk. Due to the use of laser beam technology, optical disks are also known as laser disk or optical laser disks. All optical disk are round platters. They come in different size and capacities.the two most popular types of optical disks in use today are CD-ROM and WORM disks. CD-Rom stands for Compact Disk-Read-Only Memory. It is a spin-off of music CD technology, and works much like the music CDs used in music systems. In fact, if you have a soundboard and speakers connected to your computer, you can play music CDs with your computer. The CD-ROM disk is a shiny, silver color metal disk of 5 ¼ inch (12 cm) diameter. It has a storage capacity of about 650 MB. It is so called because of its enormous storage capacity on a compact size disk, and because it is a read-only storage medium. That is, these disk come pre-recorded, and the information stored on them can’t be altered. WORM stands for write-once, read-many. WORM disks allow the users to create their own CD-ROM disks by using a CD-recordable (CD-R) drive, which can be attached to a computer as a regular peripheral device. WORM disk, which look like standard CD-ROM disks, are purchased blank and encoded using a CD-R drive. The information recorded on a WORM disk by a CD-R drive can be read by any ordinary CD-ROM drive. As the name implies, data can be written only once on a WORM disk, but can be read many times. That is, as with a CD-ROM disk, once data has been fetched on to the surface of a WORM disk. It becomes permanent, which can be read, but never altered. Moreover writing on a WORM disk can’t be done in multiple sessions, and all the data to be recorded have to be written on the disk surface in a single recording session. Laser beam technology is used for recording and reading of data. The cost-per-bit of storage for optical disks is very low, because of their low cost and enormous storage density. The optical disk a more reliable storage medium than magnetic tapes or magnetic disks. Optical disk have a data storage life in excess of 30 years. This makes them a better storage medium for data archiving as compared to magnetic tapes or magnetic disks. Since data once stored on an optical disk becomes permanent, the danger of stored data getting inadvertently erased/ overwritten is not there with optical disks. Due to their compact size and light weight, optical disks are easy to handle, store and port from one place to another. Music CDs can be played on a computer having a CD-ROM drive along with a sound board and speakers. This allows computer systems to be also used as music systems, whenever desired. It is a read-only (permanent) storage medium. Data once recorded, can’t be erased, and hence, the optical disks can’t be reused. The data access speed for optical disks is slower than magnetic disks. Optical disks required a more complicated drive mechanism than magnetic disks. For distributing large amounts of data at low cost. For distribution of electronic version of conference proceedings, journals, magazines, books, product, catalogs, etc. For distribution of new or upgraded versions of software products by software vendors. For storage and distribution of a wide variety of multimedia applications, such as video games. For archiving of data, which are not used frequently. What is Mass Storage Devices? 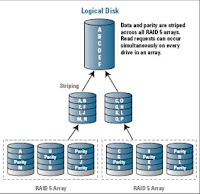 A disk array, which first appeared on the market in 1993, is a set of hard disks, hard disk drives, and a controller, mounted in a single box. All the disks of a disk array from a single large storage unit. 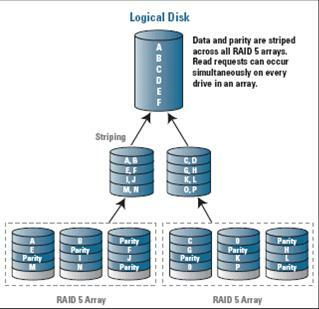 A disk array is commonly known as a RAID (Redundant Array Of Inexpensive Disks). The term inexpensive comes from the fact that each of the medium-sized hard disks in the disk array is much less expensive than a single large hard disks. An automated tape library is a set of magnetic tapes, magnetic tape drives, and the controller, mounted in a single unit. Automated tape libraries are typically used for data achieving, and as an on-line data backup device for automated backup. They are mainly found in large computers centers. A CD-ROM jukebox is a set of CD-ROM disks, CD-ROM drives, and a controller, mounted in a single unit. The unit has one or more CD-ROM drives to read data form the CD-ROM disks in the jukebox. CD-ROM jukeboxes are typically used for archiving read-only data , which needs to be accessed on-line, but where access time is not very critical. For example, on-line museums, on-line digital libraries and on-line encyclopedia are a few systems, which may make use of this mass storage device in an effective manner. Candy - many secondary devices used earlier become out dated and obsoleted. Some more faster and light wight secondary devices are in market like Blue ray discs. informative for my project on secondary storage devices of computer system. I'm glad to see this information providing blog. Important information removal scenario is generally a headache for the user. A number of recovery solutions happen to be launched by the professionals, so that an individual can certainly effortlessly retrieve his deleted data. 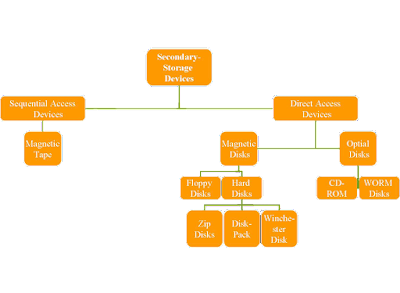 If a data loss condition is occured, individual got to know which software or software package to apply in order to manage this scenario of computer data damage. This is a great article. I have been trying to find new ways to store my data for all my employees. Since they each have their own clients I would like them to each have individual access to their own online storage service. I would also like our computer systems to have Data Protection. Hopefully there is a new innovation that can handle emergency situations when data is lost or needs to be retrieved. I know using hard disks is a normal way to protect and store data but I would like to try something digital and easily accessible on the internet from their computer. That's a very detailed and informative post. You've tried to cover everything related to secondary storage devices. I'd like to add some latest secondary storage devices to the list such as Blueray disk, USB flash drives drives and USB external hard drives, which are in trend these days and having much more storage space and better performance as compared to traditional storage devices like floppy disk. Hi, for my wireless reciever that allows my xbox 360 controller to work on my pc, I need more power. I was told the solution is to get a pci usb card for it to work, but then I was thinking maybe a powered USB hub? Is there a difference between the power output on the PCI slot on a motherboard or a powered usb hub? The hub I'm thinking of buying allows 3amps to all it's usb connections. I visited your blog for the first time and just been your fan. I Will be back often to check up on new stuff you post! Can you please provide more information on this subject? BTW your blog is great. Cheers. You are a extremely clever person! Valuable site, where did u come up with the information in this posting? I am pleased I discovered it though, ill be checking back soon to find out what new content pieces u have. Very informative site, i must bookmark it, keep posting interesting articles. Thanks for the post. I'm a big fan of the blog, i've even put a little bookmark right on the tool bar of my Firefox you'll be happy to find out! Thanks i had no knowledge about it, great job. You have a great blog - I would think your readership is very high? Protect your company by training your employees on Security. Expert Tips on Information Security Awareness Training For Employees. Security Awareness Training course is designed to educate employees to reduce risk and protect company resources.